A gorgeous, eye-catching ombre color design adds understated allure to this mini dress. Cloaked in beautiful floral lace insert, this dress makes a playfully romantic statement. It also features adjustable spaghetti straps and a swing fit for a chic look. It drapes beautifully over heels for a fantastic summer look! 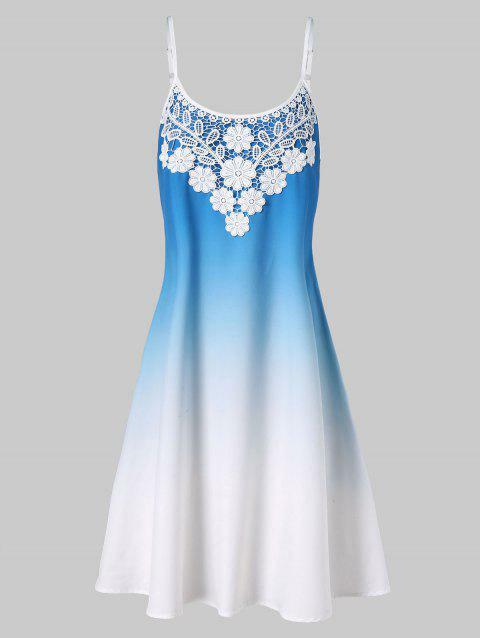 Nice cool summer dress. Pretty embroidered bodice. Casual or dress with the right jacket. Q:Hi! I'm a size 8 in US size, what size should I buy? US size 8 is size L on our website. Q:Im a uk size 10 what size would i want in this dress ?